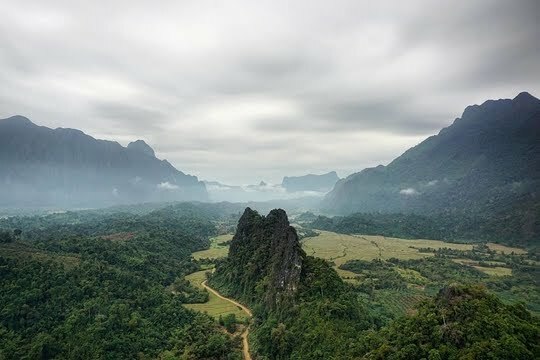 Just check out the amazing views from Namxay Viewpoint and be amazed! 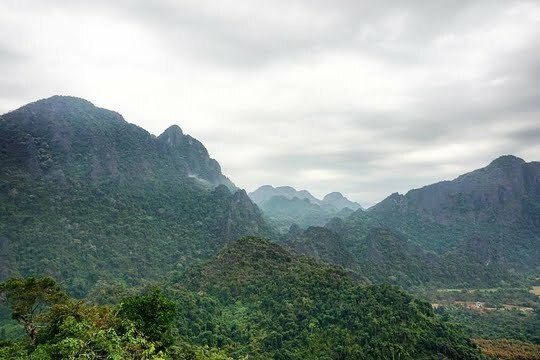 Even the road leading to the Namxay Viewpoint is scenic, what more the view from the peak! That was when I knew that the viewpoint was probably a well-kept secret that has not been publicised as wildly as its counterpart, Pha Ngeun. Having to walk quite a distance off the main road probably provides some indication as to how secluded and 'unknown' this viewpoint is as compared to the others. 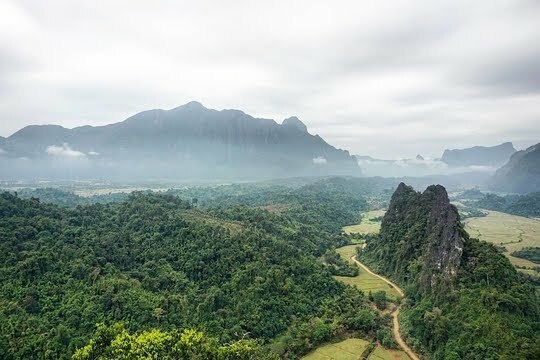 Namxay Viewpoint is located off a slip road along the route from the town centre of Vang Vieng and the town’s most famous attractions – the Blue Lagoon and the Tham Phu Kham Cave. Goodbye, gravel and tarmac. Hello, sandy dirt roads! As a result, this hike can actually be combined and corroborated to form a single day trip idea that will fit perfectly as it is quite convenient to just head down for an epic hike after getting rejuvenated in the Blue Lagoon. Just follow the path in the direction of the mountains and wait for the magic to unfold. It also paints quite a stark contrast, as the viewpoint is rather secluded and relatively unknown to the general public as opposed to the Blue Lagoon which every tour agency in town touts as the highlight. It's definitely much quieter here - and very few people going past as compared to the main road. 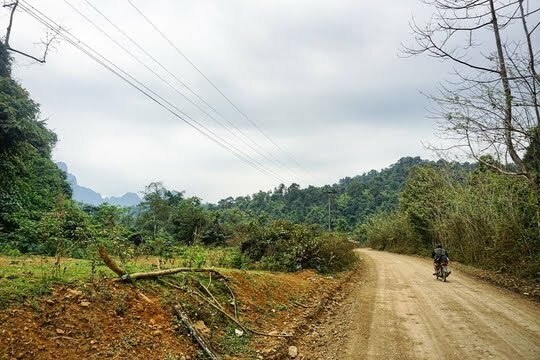 Travellers will then have to head approximately 2 kilometres down the slip road which is much quieter and more peaceful than the main road that traverses between small villages and towns. These fields and plantations seem to go on forever. 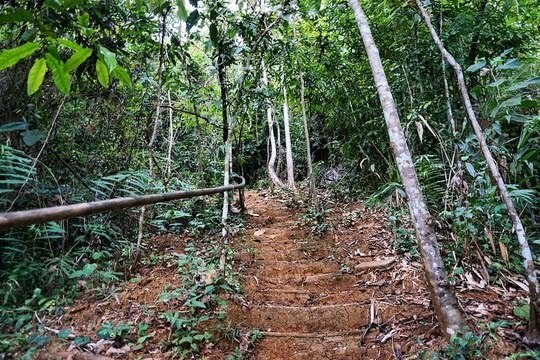 Here, they will be treated to a sneak peek into the livelihood of the locals as they traverse along the path which snakes through some of their residences and houses. These bamboo poles somehow give me the vibes of Jeju Island where houses use the number of beams outside their gates to indicate how long the owners will be out. 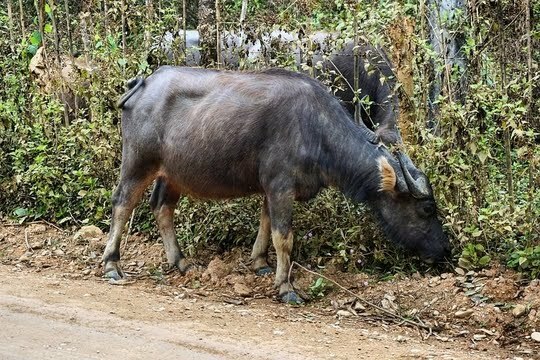 Interspersed between these villages lie more spectacular views of the agricultural plantations sitting at the feet of the mountains and wild buffaloes grazing amidst the thick foliage. 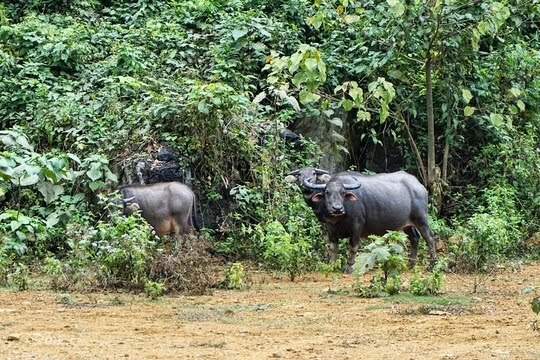 Buffalo: "Look out guys, we've got company!" This promises to be quite an experience to see an entire herd of wild animals just roaming around freely in the wild, almost reminiscent of an African safari. This little guy looks like he's too busy eating to bother about me walking past. I arrived at the viewpoint and glanced around for someone to get a ticket from, as the entrance seemed to be like a local’s residence rather than an attraction. A little girl sat in the shelter and looked at me inquisitively as I walked towards her to ask her if I was at the right place. 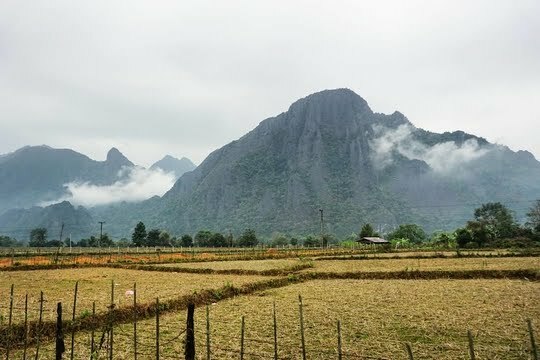 Her father emerged from the garden where he was tending to the crops and waved at me while shouting over to the girl in Lao to sell me a ticket so that I could embark on my ascent. This sign will definitely reassure travellers who may have begun wondering whether they took the correct slip road off the main road as it has been quite some time since the last sign. 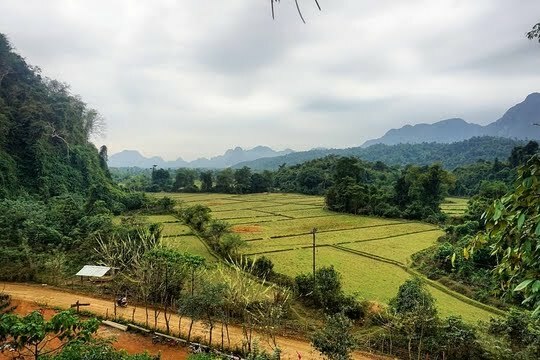 Numerous local families in the region have capitalised on the magnificent natural scenery that the region boasts of and started constructing their own paths up to the peak of steep mountains to offer amazing viewpoints towering above the limestone karsts and rice paddy fields dotting the entire land around Vang Vieng. And I don't see why they shouldn't when they have this spectacular view in their backyard! Many of these family-owned vantage points are uniquely branded and advertised on posters that can be found along the main road leading out to the Blue Lagoon. 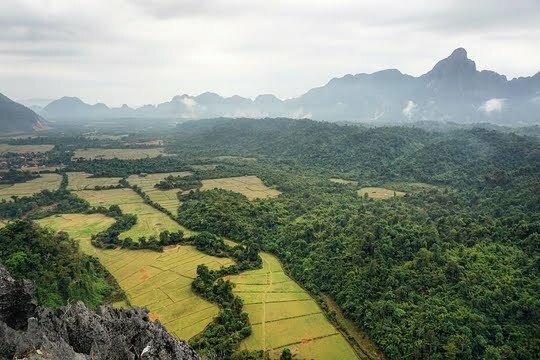 However, I can safely say that one of the most epic viewpoints that I have seen is at the Namxay Viewpoint which is owned by this amicable local family and is not that well-publicised and remains relatively unknown amongst the backpacker community. Where else can you find another viewpoint like this? This is insane! 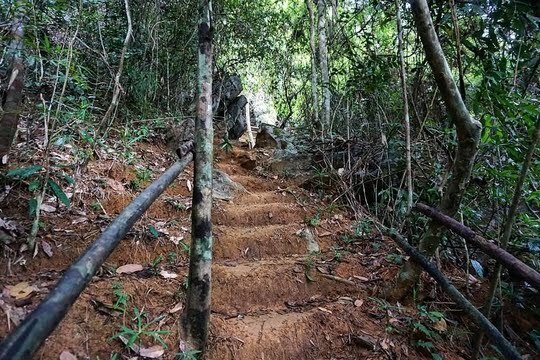 As expected, the hike to the peak of the mountain started off extremely easily with steps made out of sand and rock as well as handrails to grab on to head up the gentle incline. It started off really easy and you should really expect it to get much harder from here on. 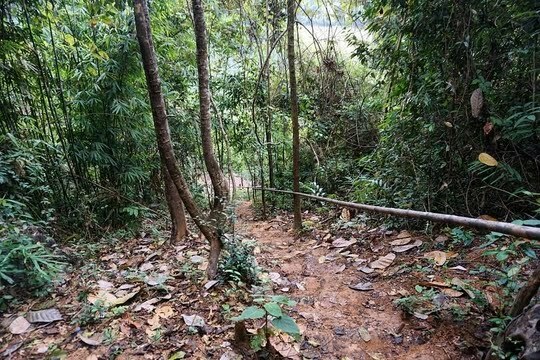 Just a simple, short climb up will lead visitors to a little hut with its roof made out of leaves as well as a bamboo mat for them to already begin taking in the magnificent views of the rice paddies just opposite the slip road from the viewpoint set amongst the jungles and limestone karsts all around. A short climb of 2 minutes already landed me this epic view. 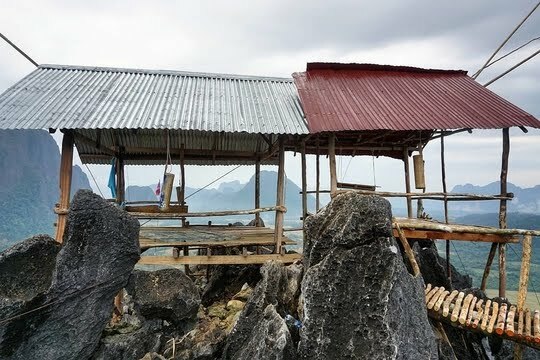 A short stop at this hut with a sip of water, a glance of the beautiful scenery (which further drives one’s imagination as to how amazing the top view will be) and travellers can continue with the gruelling climb. This feels as though I'm venturing into the jungle. Tarzan vibes! 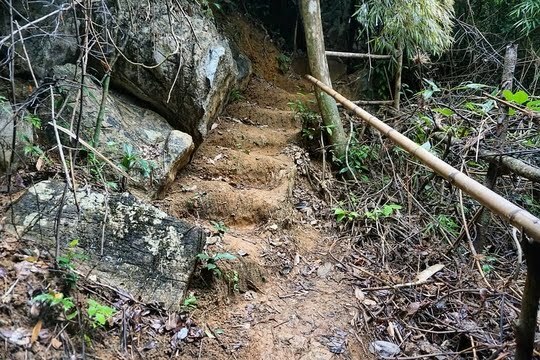 After the hut, the stairs give way to unpaved paths of soil which can be slightly more difficult to tread upon and can be quite slippery after the rain. You'll feel extremely grateful for the occasional flight of stairs made of sand. Grab on to those bamboo poles tightly for an extra source of support! 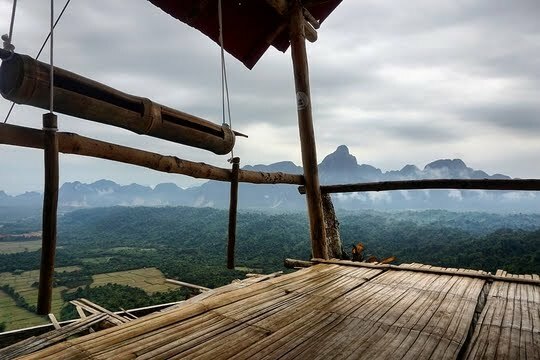 At some points, there are also wooden ladders which look relatively primitive and are made out of sturdy wooden branches, making it much easier to head up to the ultimate goal of reaching the viewpoint. 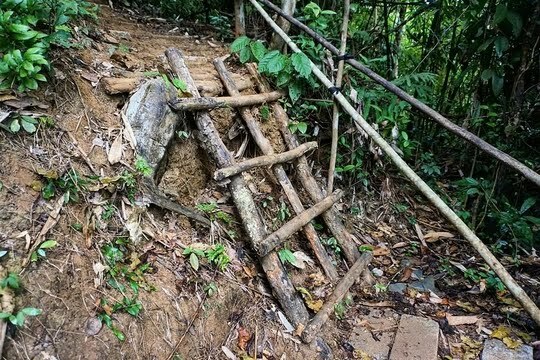 This looks like one of those old ladders humans used back in ancient times. 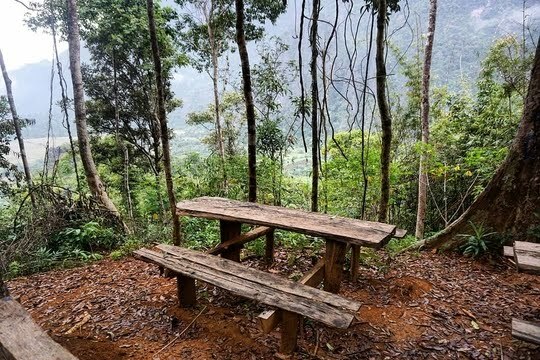 About 20 minutes into the climb, visitors will arrive at a simple picnic spot with wooden tables and benches sitting in the shelter under gigantic trees offering a teaser of what they will be able to admire up at the peak with clouds already appearing at eye level from this area. That's what I call a picnic with a view, my friend. A little hut similar to the one at the foot of the hill has also been erected here, so it also offers a splendid opportunity to relax and unwind at the altitude by doing some yoga or just meditating. Feel free to take a nap if you need some rest. 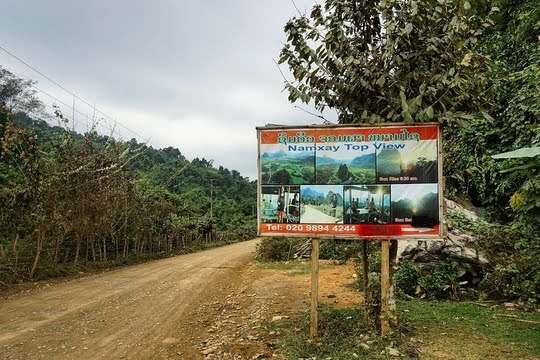 I would definitely recommend tourists to bring a simple snack, say a sandwich coupled with an energy drink, up here to take in the sights while getting rejuvenated for the last and most strenuous segment of the climb to the peak. If this view can't motivate you to make your way up to the peak, I'm not sure what else will! No soil, no mud, no path – only sharp, jagged rocks everywhere. 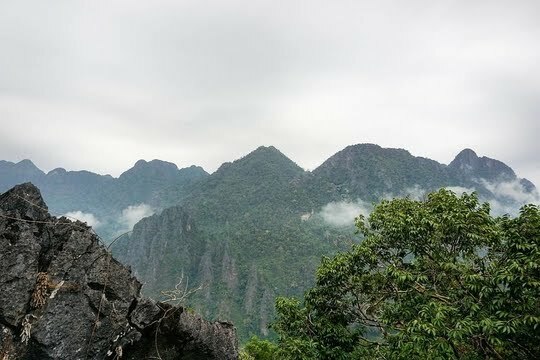 The last stretch is definitely the most difficult and exhausting, as the entire hiking path will disappear right before one’s very eyes into an entire rocky mess resembling an outcrop with extremely sharp edges protruding in every direction. That's right - you'll be climbing those rocks up to the peak! It certainly looked like the aftermath of a rockslide leaving its track all over the place here, causing travellers to have to climb on all fours. 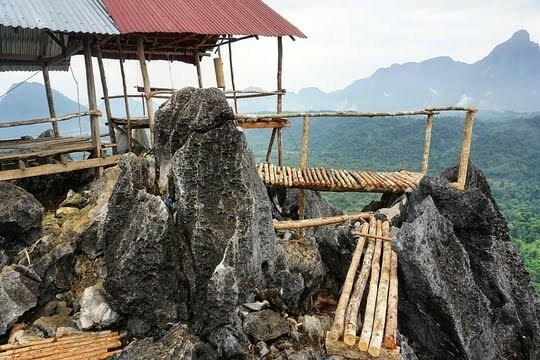 Nevertheless, it is of utmost importance for visitors to test whether certain footholds are safe and stable before pulling their weight up, as some rocks can potentially collapse and fall off the cliff if they are not stable enough. Please be very careful here - and yes, that's the slip road from the main road! 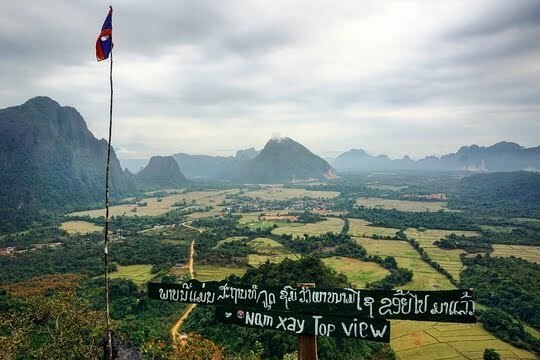 The “Namxay Top View” signage and the Lao flag welcome travellers who have successfully ascended to the peak of the mountain that offers spectacular views from every single direction. 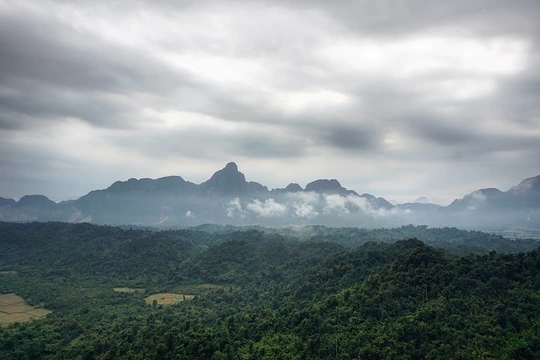 This view is definitely worth all that effort and sweat climbing up to the peak! 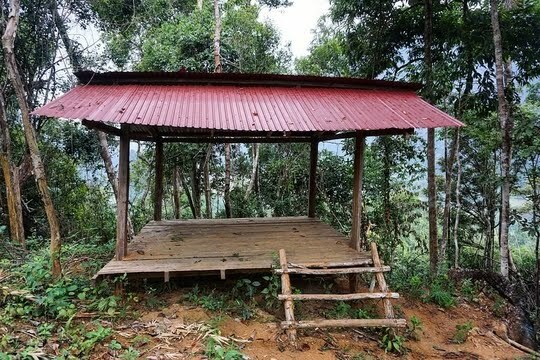 Two sheltered huts with bamboo mats are available for visitors to rest and seek shelter from the scorching hot sun (or from the rain, in my case) after that very exhausting hike up to the peak as well as to admire the mountainous landscapes. 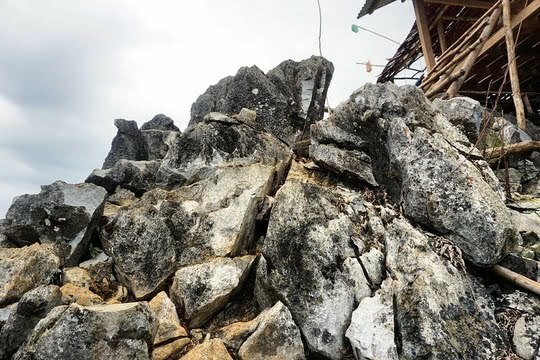 Without these huts, I cannot imagine how my hike to the peak would have ended in the rain. 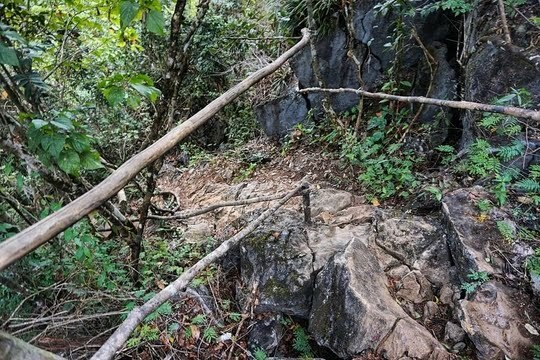 After getting sufficient rest, visitors will be able to walk carefully along the precarious-looking walkways made of wooden branches and logs affixed together to get a closer look of the rice paddy fields sitting right at the foot of the hill which they had just walked past less than an hour ago. It certainly takes some time to get used to walking on these dangerous-looking platforms that look as though they may collapse any minute. 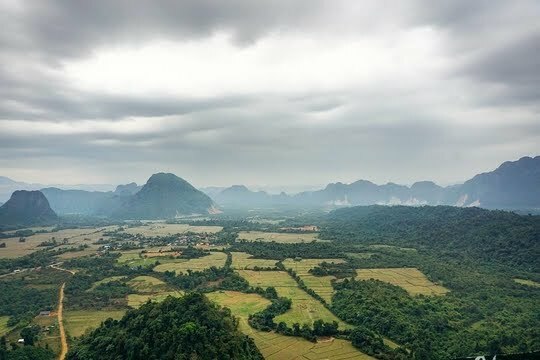 Even though it was a very cloudy day which made the views slightly blurrier and greatly reduced the visibility, the cloud layer definitely added to the mysterious vibe of the photographs as it looms above the green pastures and plantations below. And being able to admire all that from one of these vantage points! I also had a good comparison of how tall this viewpoint was as I was literally at eye level of the clouds. That's not something you can see every day! The coolness of the rain also made the hike much more comfortable without perspiring profusely, and it brought about the icing on the cake – I had the entire viewpoint to myself! 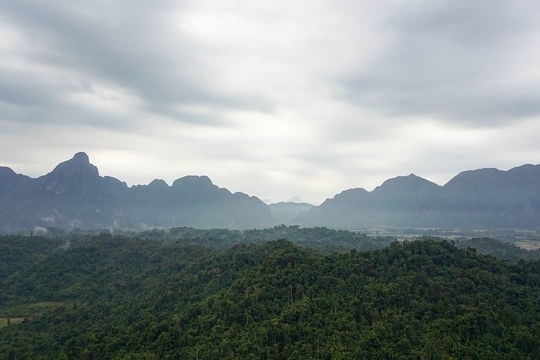 A Thai couple was heading down when I was making my way up the final stretch of 50 metres and four hikers just reached the viewpoint when I was about to begin my descent. That's where I last saw any fellow hikers at all. A picture paints a thousand words, so here are some of the shots I managed to capture during my time at the peak of the Namxay Viewpoint that definitely made all my time and effort ascending that mountain worthwhile and satisfying. Imagine what kind of photographs can be captured on a bright, sunny day! 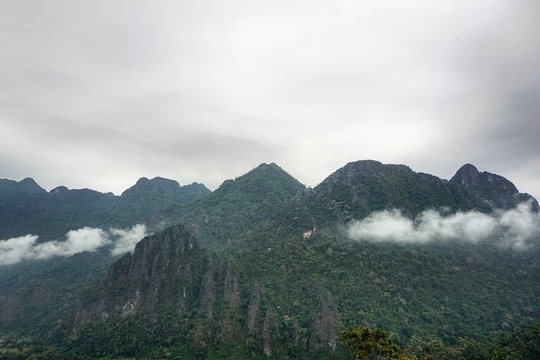 The clouds give that ghostly vibe which accentuates the beauty of the mountains amidst the mist. Limestone karsts towering over the entire area do not seem to be that tall now. Okay, maybe not. The lush greenery of the area seems to teleport me into the Amazon Jungle. The cliffs here seem to be darker than those around Silver Cliff (Pha Ngeun). 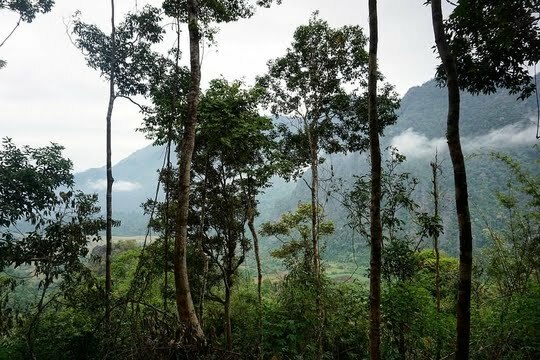 The agricultural plantations starkly contrast against the thick foliage of the wilderness. This will make for an amazing location to view the sunset (if only I wasn't walking back to town). 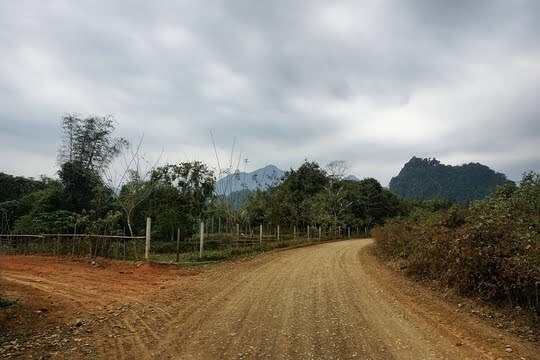 After arriving at a crossroad where there are two routes that visitors can choose from, they should head down on the path on the right even though both paths lead to the same destination. You won't want to get stuck halfway along this slippery, sandy surface. This was created in order to avoid tourists who are descending from the peak from obstructing other travellers who are making the ascent. It is a long way down to the foot of the hill, so be prepared! 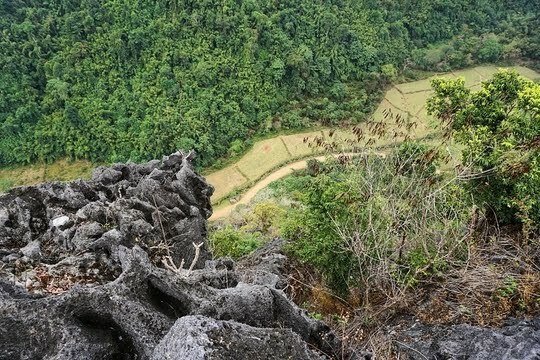 The way down was definitely much more tedious, as travellers will spend much more time testing the stability of various footholds since they cannot be judged visually from above. The worst part was descending from the rocks though. Gosh. Before they know it, they will be back at the foot of the hill where they can treat themselves to a refreshing rest in one of the huts before heading off to their next destination. Back to where the entire journey started: "Hello people, I'm back!" Even after returning to the ground, images of the epic views and scenic landscapes will definitely continue to linger in their minds. This view will stay with me for quite some time - and I'm sure it'll stay with you too. 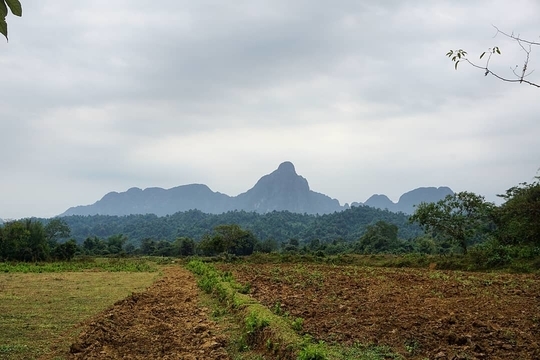 Along with the picturesque photographs of the limestone karsts and rice paddy fields, visitors will also have amazing stories to share with family and friends about this off-the-beaten-track adventure which remains a hidden gem and one of the best kept secrets in Vang Vieng. 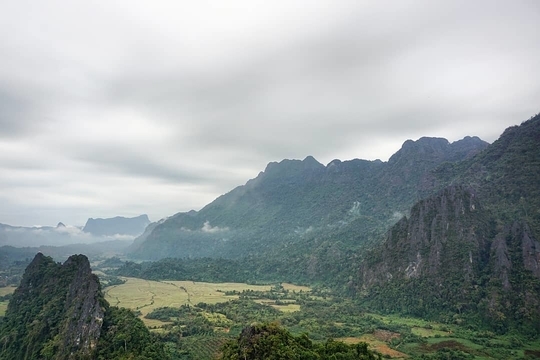 Set deep in the mountains, Namxay is where you can truly stand before these limestone karsts. There is only one thing that can beat a spectacular view – having that view all to yourselves, and that is what Namxay Viewpoint has to offer! No selfie sticks to jostle with, no tourists to fight with for the best views. Just nature and me. Many people say travelling helps to broaden the mind, but they often forget that travelling also helps with the process of self-discovery. I, for one, am acrophobic and do not usually partake of such activities. But no way was I going to let my acrophobia get between me and this view! However, the hike up alone, aggravated by the rain during the ascent that added to the nerves, made me realise that I am braver than I think I am. I guess this is the reason why we avid travellers love to travel – we always learn something new every day on the road, be it about the local culture, about the local history or something closer to the heart, about ourselves. 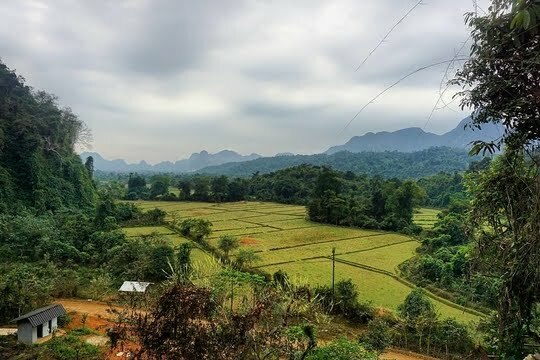 There are just so many ways to appreciate the natural landscapes all around the town of Vang Vieng which boasts a wide range of amazing natural wonders such as caves and waterfalls. Join me as I explore other attractions in the town on another epic adventure! 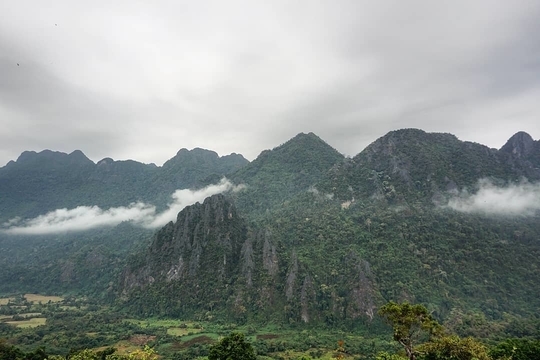 Are you inspired to visit Vang Vieng after reading this post? 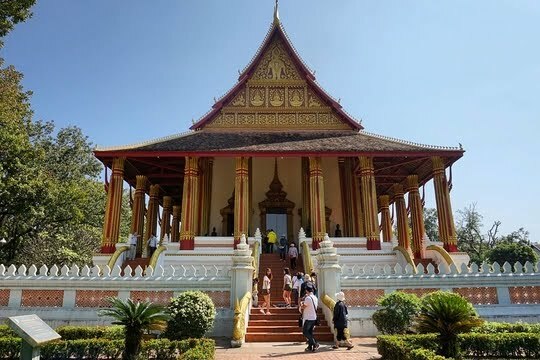 If so, please feel free to check out the affordable accommodation options in this capital city which have been made available by Agoda in the widget below. You will be able to compare among a wide range of hotels, hostels and apartments to find your ideal accommodation in terms of price, location, comfort and service - to make your vacation a lovely experience! I love hiking. 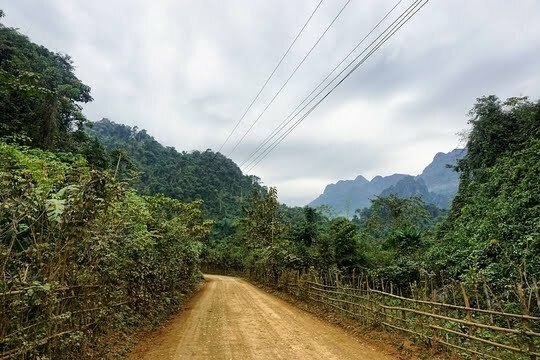 Doing it in Vang Vieng would be so much fun! It’s amazing that even the receptionist didn’t know about the Namxay Viewpoint. This is exactly the kind of place that excites me. The rest places are so cool. I would think twice before stepping on those scary wooden platforms. I have made a mental note to visit the Namxay Viewpoint. The views from the top are absolutely stunning. 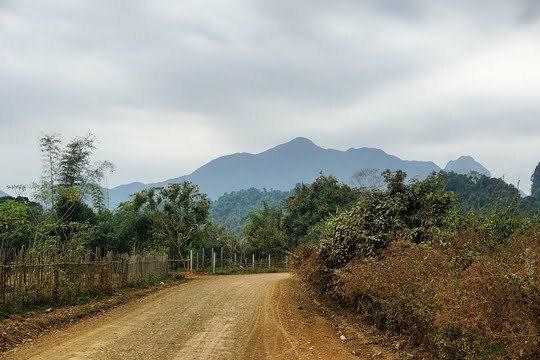 In most of these scenic places, some of the most rewarding and vantage points are often those which are well off-the-beaten track and thus the best-kept secrets. If it is not known even to the locals (the receptionist in this case) one can infer that the viewpoint will not be touristy/crowded. What an awesome hidden place! It definitely looks like that you did have the place all to yourself. And maybe the locals just don't want too many tourists finding it since it was not so easily found. Good job finding it though! Beautiful view! Wow! 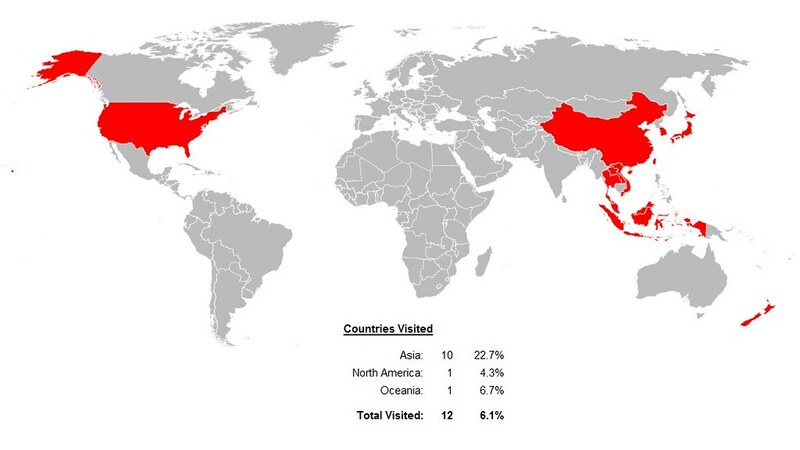 Thanks for sharing, the photo of views at the top are incredible! Glad you paid the entrance fee to support the upkeep of the paths and to support the local community. 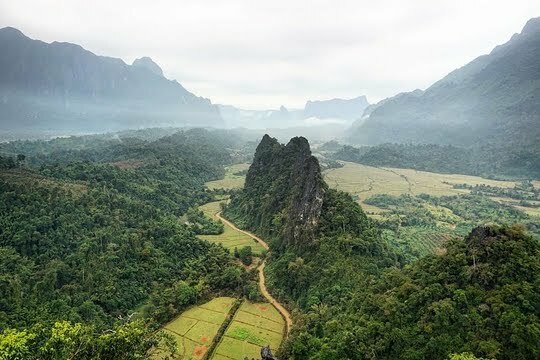 It would be a great experience to visit Vang Vieng and the Tarzan Vibes. The lush greenery is surely a nice view to enjoy. Hopefully, this stays this way in the future. You always manage to find the most awesome views! These photos are stunning. 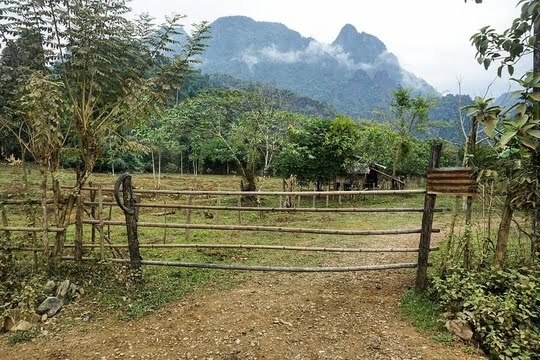 I have visited Vang Vieng but did not see anything like this.... I must go back and explore more! The view points and the views you got are amazing. My request to you would be to keep it secret so that it stays as pristine as it looks! That looks amazing! 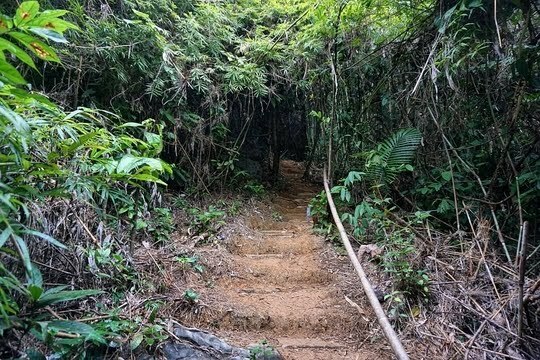 I've not heard of this place before but it reminds me of Mt Fansipan. The so called walkway doesn't look sturdy at all! Although the one I did in Sapa was just as precarious looking and I did go on it as it gave us the best vantage point. The hike looks doable. Just have to have good shoes and plenty of water. Great post! 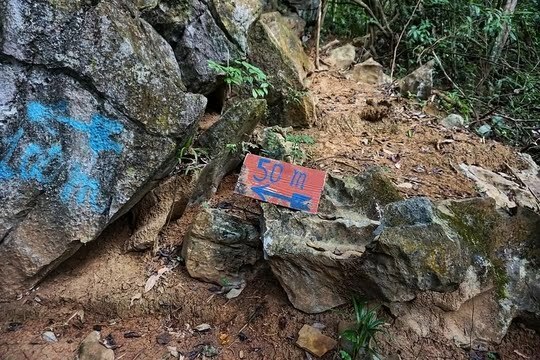 I'm not much of a hiker, but this trail surely looks fascinating! Love the views you have captured en route and from the top. Beautiful post! 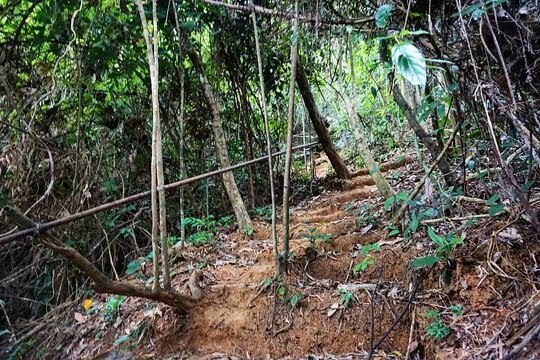 That trail looks like a fantastic hike! 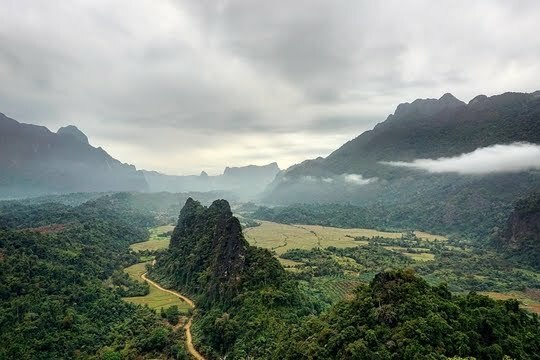 Would love to check this out when I'm in Laos! 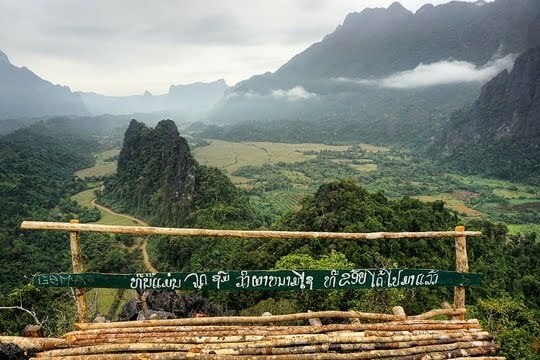 The way to the Namxay Viewpoint is itself so beautiful. And then the views from here are unparalleled. The patches of light and dark green, the beautiful horizon across them! I should keep it bookmarked for my own trip so that I don't miss it. 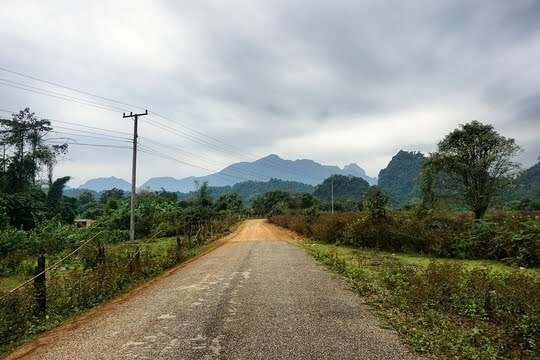 Thank you for taking me back to the dirt roads of Laos and the idyllic villages they usually lead to. Namxay Viewpoint look certainly worth the hike. I really enjoyed your photographs, which made me feel as if I was trekking alongside you. You have really uncovered a hidden gem in Namxay Viewpoint. The place looks amazing and the views are spectacular. But I can see that the hike to the place itself was very scenic and an adventure in itself. I was really fascinated to know that the view points are owned by private families. That is something new to know. Wow! 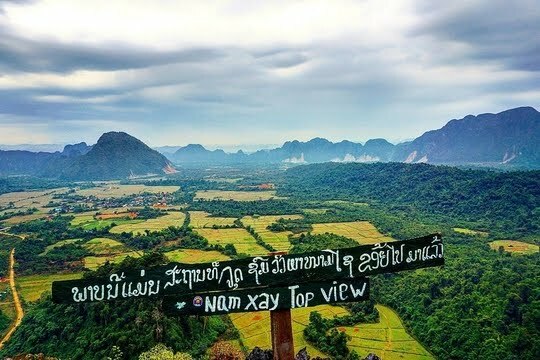 The views from the Namxay Viewpoint are to die for. 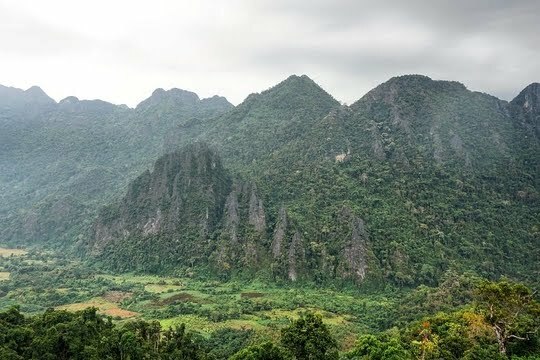 I'm amazed why locals don't know much about this hidden gem - probably their best kept secret as you mentioned. 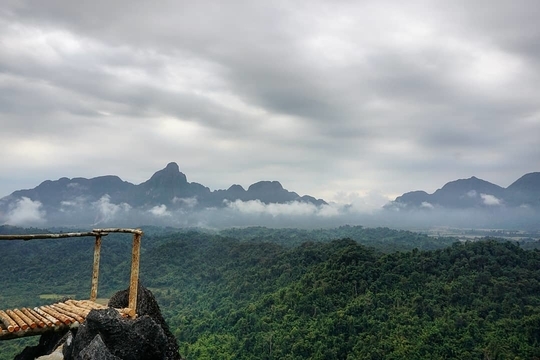 Great you took all that trouble to reach the hidden viewpoint and clicked those amazing pictures. The route to reach the place is also picturesque and offers magical views. Wow! Namxay Viewpoint is fantastic, what a great adventure you had. I always look forward on those travelers who love trekking/hiking cause it's super exciting to see I can't wait to have my own experience as well. I will definitely visit this place! 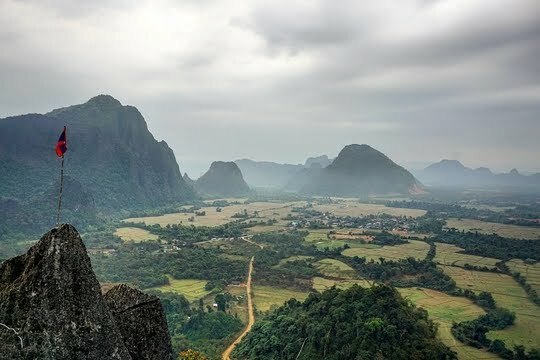 This place is like a haven for every adventure lovers, All the hiking lovers will crazy to visit this place. 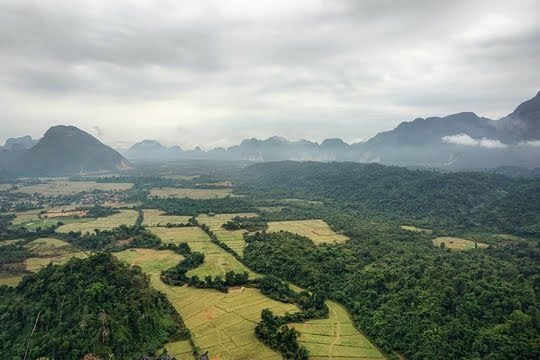 The view from the top is amazing, I never visited Vientiane, but for exploring this place must visit Vang Vieng. All the picture, which you have taken on your trip, its a great motivation for all our generation. Thanks for sharing your adventure. keep inspire us.